Among fans of sword and sorcery epics and legendary characters, Robert E. Howard’s Conan is a big favorite. His exploits in comics, movies and more have entertained and enthralled millions around the world for many years. 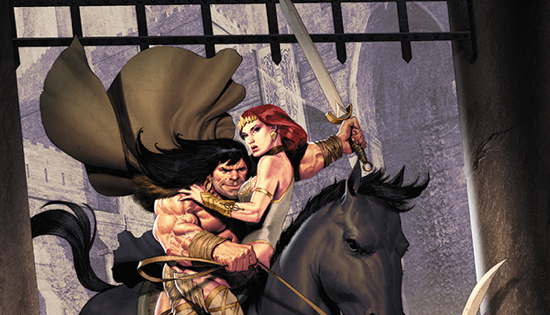 And now, Conan is back again and Dark Horse has him in a new four-part miniseries from Fred Van Lente and Ariel Olivetti. The miniseries is alled Conan and the People of the Black Circle and it takes place a decade later than the current Conan ongoing series. Check out the full cover after the break. Look for Conan and the People of the Black Circle #1 in stores October 16. Solomon Kane, based on Conan creator Robert E. Howard’s series of stories, begins the film slashing his way around the world destroying anything, and anyone, who gets in his way. He even kills his own men, especially when they show cowardice. This tirade of evil comes to a screeching halt once Kane encounters the Devil’s Reaper, whom the devil has sent to collect Kane’s soul. Kane, barely escaping with his life, realizes his evil ways have led him to this point and decides that he must change if he is to survive. Once he realizes the error of his ways, he then embarks on a new life, relinquishing violence in an effort to achieve redemption. Of course, if Kane had stuck to that decision, this would be a very short movie indeed. Fortunately, he doesn’t and inevitably must return to his violent ways. But this time around, instead of the greedy, evil mercenary he once was, Kane now has a noble purpose and an actual chance at the redemption he seeks. The innocent daughter of a Priest (Pete Postlethwaite) who had befriended Kane is taken prisoner and to save her, Kane will do whatever he needs to do — even if that means killing a few people along the way. Plus, an all-consuming evil is threatening to take over England and Kane has decided that man of peace or not, he can’t let that happen. We’re still on the fence about the upcoming Conan the Barbarian. Sure, it could be cool and star Jason Momoa might just become the “next big thing” and take Arnold’s place as our new favorite Cimmerian warrior. Or, the film could just as easily go down as yet another in a string of bad ideas that die a quick death at the box office. That’s what makes this business so interesting. Pretty much anything can, and does, happen. Regardless of what will happen in the future, right now we’ve got the new poster for the film to share with you today. It gives us a good look at the character in action and if the movie ends up looking, and being, this cool, we’re hooked. In addition to Momoa as Conan, the film features Rachel Nichols, Stephen Lang, Rose McGowan, Saïd Taghmaoui and Ron Perlman. It’s directed by Marcus Nispel and written by Thomas Dean Donnelly & Joshua Oppenheimer and Sean Hood. Check out the full poster after the jump. Conan the Barbarian hits theaters on August 19th. We’ve been following this one for quite some time and have been bringing you all the news, including that the film will be in 3D and who would play the legendary character. Now, we’ve got even more in the form of the brand new teaser trailer for the film. Adapted from the original works of Robert E. Howard and “faithful to the mythology and psychology of his iconic character,” Conan the Barbarian stars Jason Momoa, Rachel Nichols, Stephen Lang, Ron Perlman and Rose McGowan. It is directed by Marcus Nispel. Check out the teaser after the jump. Conan the Barbarian arrives in theaters on August 19th. Since I was first exposed to Conan in cinematic form by Arnold Schwarzenegger and John Milius in 1982’s Conan the Barbarian, that version has been by definitive on screen incarnation of Robert E. Howard’s character. Now, with the reboot of the franchise well underway and a new actor taking on the role, I may need to get used to a whole new version. Previously, we brought you news of the new actor, Jason Momoa, and some other info from the film. Now, we’ve got another more “official” look at Momoa as Conan in this new photo from the Nu Boyana Film Studios site. Although it’s just one pic he does look a lot like Conan, especially as envisioned by Frank Frazetta in many of his iconic paintings. Momoa seems to have the look of a true Cimmerian and I, for one, am going to give him a chance to supplant Arnold’s portrayal as my favorite. The Lionsgate release of Conan, under the direction of Marcus Nispel, in addition to Moma features Rachel Nichols, Stephen Lang, Bob Sapp, Leo Howard, Ron Perlman, Said Taghmaoui and Rose McGowan. Look for it to hit theaters sometime in 2011. Check out a larger pic of Momoa as Conan after the break. Between Avatar raking in more money than any other film in the history of Hollywood, and other studios jumping around to upgrade their films for that extra 3D bump, such as Warner pushing back Clash of the Titans so they can go back and convert the film to a more 3D-happy stock, it looks like even more films will be getting this treatment. IESB recently reported that Lionsgate’s upcoming reboot of Conan the Barbarian (now just titled Conan) will be going 3D, hoping that the film will bring in some of those fans that made Pandora a cash cow. Many other studios have fallen in line with this method, such as MGM changing the release date more than a year so that Joss Whedon’s Cabin in the Woods can get the 3D changeover. Conan, based on the pulp series by writer Robert E. Howard, will begin filming next month, with Stargate Atlantis actor Jason Momoa stepping in as the sword-swinging barbarian. Mickey Rourke is also rumored to be joining the cast. The story of Solomon Kane is quite epic, full of demons and monsters, the actual journey of the film getting to domestic theaters seems to be even more interesting. The film has yet to be picked up by an American distributor, which means it could be some time before we ever get to see Michael Bassett’s film in theaters, if at all. The film follows closely to the original books by Conan and Krull creator Robert E. Howard, while taking some impressive liberties with CG work and effects. The story follows the titular Kane, a priest who sells his soul to the devil tries to redeem his soul by fighting the henchmen of Hell. Starring Rome’s James Purefoy, with MIchael Bassett adapting the screenplay and taking the helm, the film looks to be making quite a lot of noise in the critics’ circles. Still no word on when we’ll get to see the entire film, but in the meantime, we’ve been bringing you plenty of clips for you to feast upon. Check out an all-new behind the scenes feature after the jump. This week more than one thing involving Conan seems to be getting settled. Yesterday, we told you about Conan O’Brien making a deal with NBC to step away from The Tonight Show. Now, word comes from Deadline Hollywood that Millennium Films, Lionsgate and Paradox Entertainment have chosen an actor to take on the role of Conan the Barbarian in their brand new Conan movie — and that actor is Jason Momoa. The film, which re-boots the Conan franchise and tells the origin of Robert E. Howard’s famous character, is now on course for a March 15 production start in Bulgaria. No word yet on additional casting or a release date but we have heard that producers have reached out to Mickey Rourke to play Conan’s father in the film. More on that as it develops. The upcoming film Solomon Kane can’t seem to catch a break. Casting allegedly began back in 2001, when it was announced Christopher Lambert (Highlander) would be taking on the Pulp role. That version eventually died out, and the project went on the shelf for several years. Later, in 2007, it was announced that James Purefoy (Rome) would take on the titular role, with British director Michael Bassett handling the directing duties. Principal photography began in early 2008, and the film wrapped nearly a year later. The film has been completed for quite some time, but has yet to find a US distributor, which means we may never get to actually see it in theaters. With that said, other countries are still planning on a late December/early January release date, and with that comes some great marketing and clips from the film. After the jump, check out the brand new “Hall of Mirrors” sequence, which shows that the film will have just as much suspense as it will action. 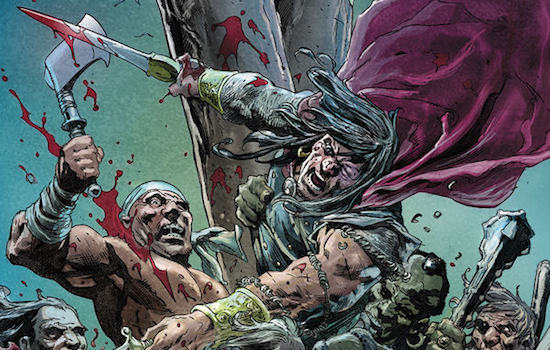 We’ll be sure to bring you more news on a US release of Solomon Kane as it comes to us.